"A deliciously fresh and healthy farro salad. 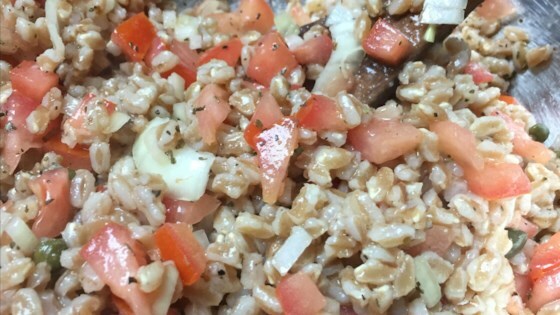 Whole-grain farro is cooked til tender, then combined with fresh veg and plenty of olive oil." Bring water to a boil in a saucepan; add farro. Reduce heat to medium-low, cover, and simmer until farro is tender, about 30 minutes. Drain and let cool. Mix farro, tomatoes, onion, capers, garlic, and basil together in a bowl. Drizzle olive oil over the top. My family loves this dish! My kids (11 and 6) both eat it really well! As a treat, we add feta cheese on top. Too strong raw onion taste, but very good otherwise. Will make again for a summer BBQ.